My sister gave me two of her palms. They had been in one pot together and I separated them. Now, one of them is dying. I was very careful not to cut the roots and put them in the same pots and the same soil. One is thriving while the other is in decline. What do I do? 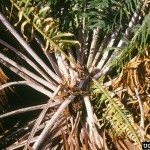 The fronds are not yellow but look like they are drying out. Some of the ends of the leaves are brittle, while others still have moisture. What is going on? This is most likely a watering problem. The palm is either getting too much water or not enough. The symptoms of both problems are similar, and they can include drying or wilting leaves and brown leaf tips, so you will have to check the soil. Check the soil every few days after watering, and water when the top inch of soil becomes dry. If this takes longer that a week, the pot may be too big. Overwatering can happen if a plant is moved to a larger pot so that the soil takes longer to dry out.